I suppose my first piece of British literature was the hardcover copy of Mother Goose Nursery rhymes that I received as a young child. I still remember my fascination with the strange words and illustrations–tumbling bridges, broken eggs, blind mice, and ashes. Not always the cheeriest, these nursery rhymes, though there are a few with a more positive theme. Hot Cross Buns, for example. Do you recall? I always longed to taste a real hot cross bun, along with fish and chips, crumpets, Turkish delight, and all the other mysterious British foods that I’d read about over the years. But I never got the chance to sink my teeth into one of these sweet, spiced, raison-dotted Easter treats until I moved to Scotland. Now, they’re one of my own favourite accompaniments to an afternoon cup of tea. They can be eaten lightly toasted or cold, and spread with generous lashings of butter (I never said they were particularly healthy, just tasty, although the ones pictured are whole grain!). The recipe does involve kneading and yeast, and if that sounds just a wee bit too scary, you could try buying some plain or sweet buns or rolls and making crosses with white icing. Or, if like me, you live in the UK and perhaps feel that you’ve already consumed enough hot cross buns for the season, well, go on a have a few more, but in a different form, perhaps? The following dessert would make a lovely end to your Easter dinner. 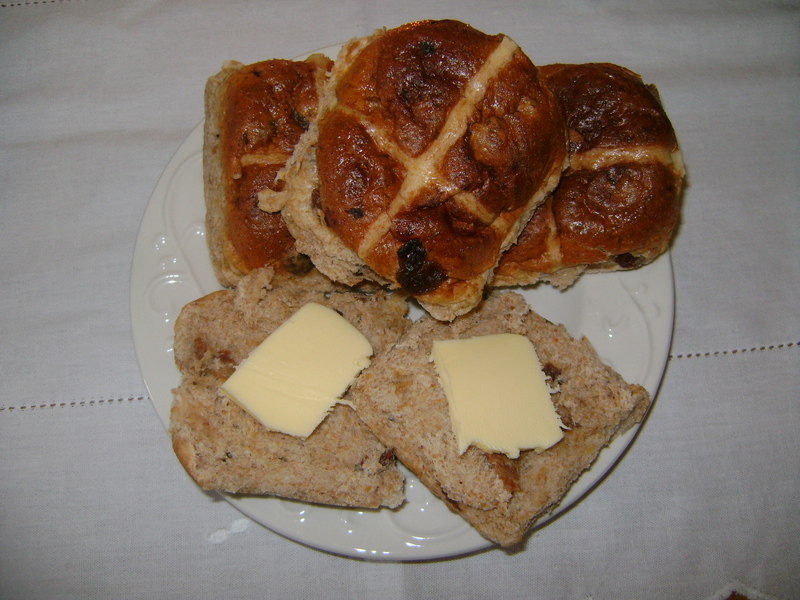 Cut some hot cross buns in half, add a thin layer butter, and then put them back together. Place into a baking dish and sprinkle with chocolate chips. Beat 2 eggs with 1 cup of milk and a tablespoon of sugar and pour the mixture over the buns. Then sprinkle a few extra chocolate chips on top. Bake at gas 3, 170 C, fan 150 C, 325 F for about 30-35 minutes, or until just set. 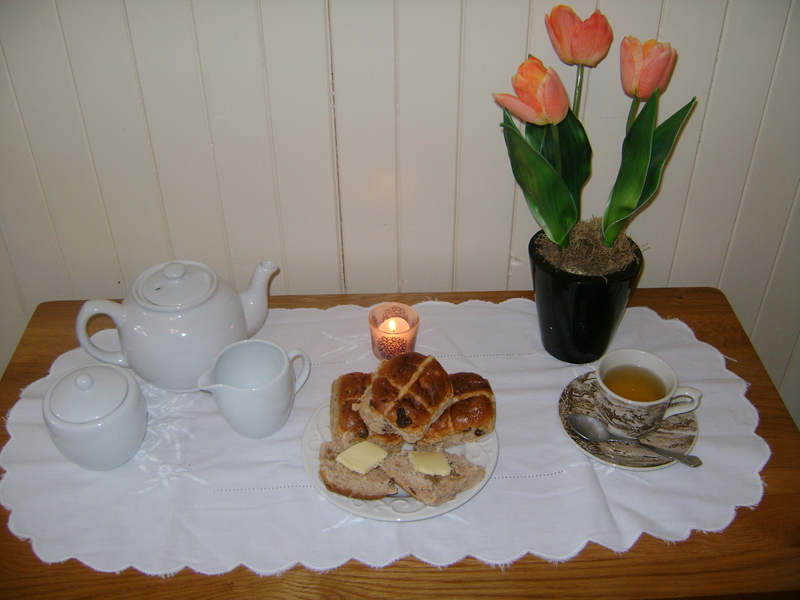 To make your hot cross buns more than just a delicious treat, read about the very first Easter in the Bible, in Mark chapters 14 to 16. Or, if you have children, use the crosses as an opportunity to speak about the real meaning of Easter with the precious little ones in your care. You could talk about the shape of the buns, too, which can remind us of the stone that the angels rolled away from Jesus’ tomb. For the real wonder, of course, is not that Jesus died for us, but that he rose again. For other ideas on how to make your Easter special, see my previous post on making easy, dainty Victorian Easter cards.